The Thornhill SAPS in the Eastern Cape early this morning, 26 October, seized two firearms from a motorist who was pulled off the road under the influence of liquor. Photograph attached of the seized firearms, magazines and ammunition – supplied. The SAP members were busy conducting routine patrols when they noticed a maroon VW Golf driving recklessly on the R331 at about 1 am this morning. The driver was arrested on three charges: for being under the influence of liquor while driving; for handling a licensed firearm while under the influence of liquor; and for illegal possession of eight rounds of ammunition for a shotgun. 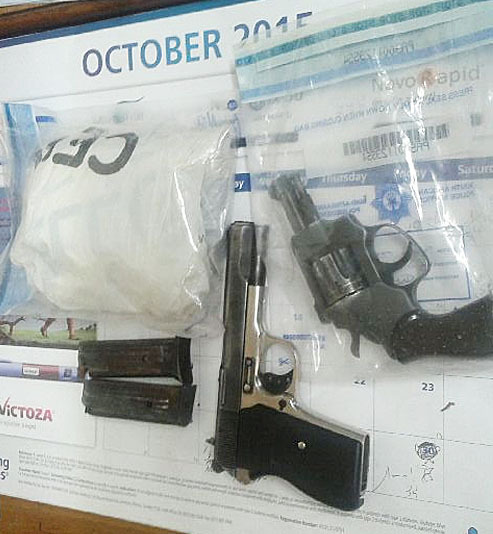 The 28 year-old passenger in the car was also arrested for the illegal possession of a 9 mm pistol and the illegal possession of ammunition for it. Both men are due to appear in the Hankey Magistrate’s Court on 28 October 2015. The Acting Humansdorp Cluster Commander, Col Simon Swarts commended the members for the excellent work they performed. He applauded the members and encouraged them them to keep up their good work.